Does it look low to you? That’s because it sits on lowering springs. The weight of the strengthening beams forced the car down at the back. Scott says he ripped out the old suspension and ordered three sets of front springs of different specs so he could play around with the ride height to equalise front and rear. Next thing, he’ll be saying there’s an old Vauxhall four-pot under that rear cover. Not a chance: Scott props it open with a piece of 4x2 to reveal the car’s original, and suitably grimy, flat 12 engine. Somewhere in there is the original five-speed manual transmission, too, as evidenced by the dull alloy transmission gate downstream in the cabin. Scott bought the car from a bloke in California. 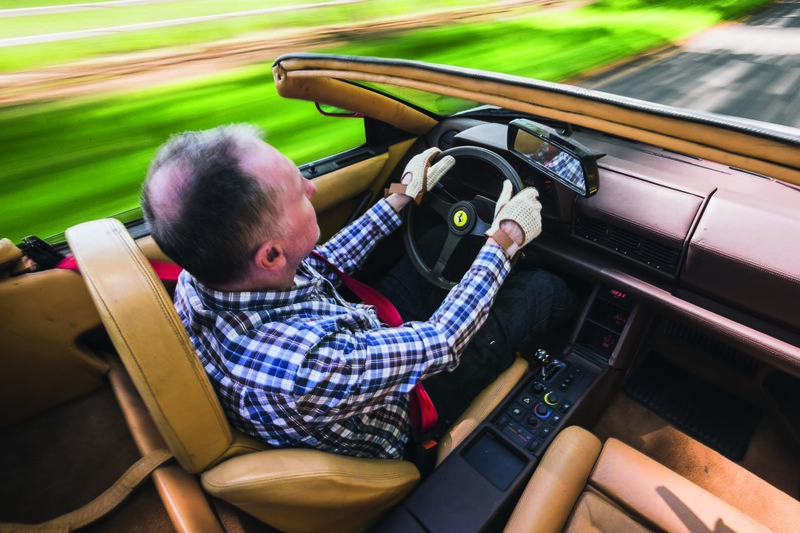 At the time, he was looking for an engine cover for his 1990 Testarossa coupé, a left-hand-drive car he’d bought from the Netherlands. (Seven of his Ferraris are left-hookers.) There he was, surfing the web, when up pops this four-year-old ad for an unfinished Testarossa spider project car. But as Scott’s giant Ferrari puzzle came together, the more he loved its raw and unfinished appearance. No bad thing, either, since to bring it to factory standard would have cost a bomb and, in any case, without a roof, it could never be a purist’s Ferrari and his investment would never be recouped. He decided just to enjoy the build, make the car mechanically perfect – and stick with the rat look. 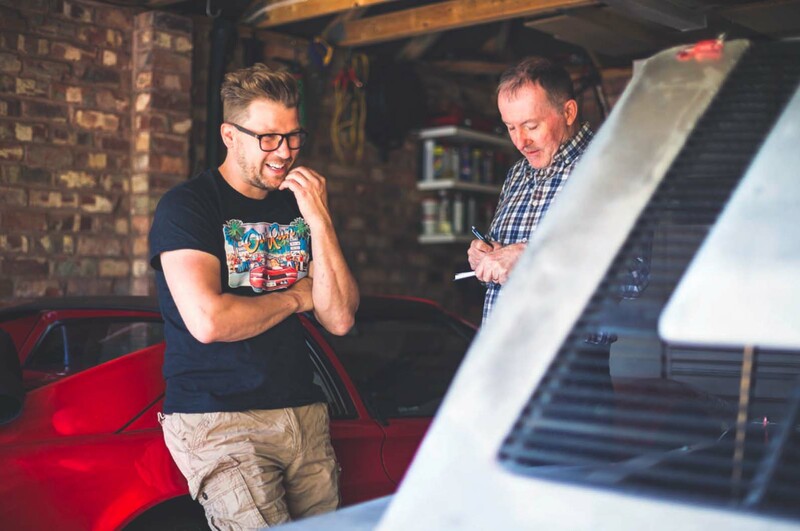 “For me, the rat look is where the car is perfect under the skin but looks like it’s been sat around, untouched and never restored,” says Scott. “Bits I’ve since acquired or refitted were finished in red so I’ve left them because they add a touch of colour.” To describe Scott as a Ferrari nut is something of an understatement. 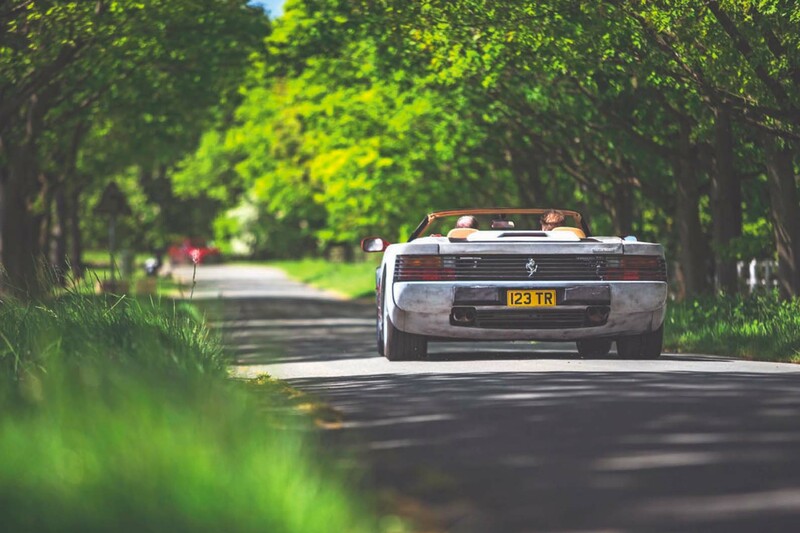 His passion for the marque began as boy when he saw a competition on the back page of Reader’s Digest to win a 308. At the time, his dad never stopped going on about the 246 Dino he dreamed of owning, and then Out Run, the Sega game, came out, featuring a Testarossa Spider. 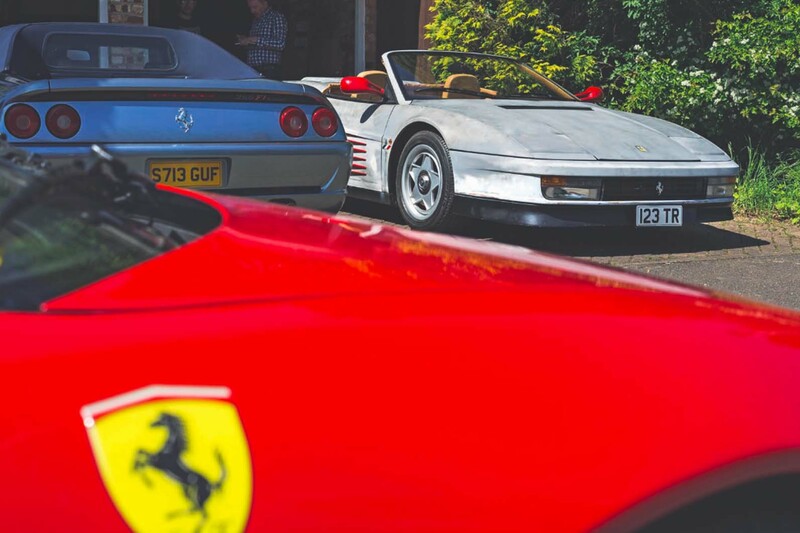 “When, eventually, I could afford to, I bought my first Ferrari – a 348 Spider,” he says. At this point, I should point out that Scott, a down-to-earth chap of 42, appears to be comfortably off but by no means loaded. He’s freshly divorced and is taking a year out of his job as an IT bod to consider his future. He has recently moved into a small estate somewhere in the Berkshire commuter belt; nice houses but with driveways too small for more than two cars. 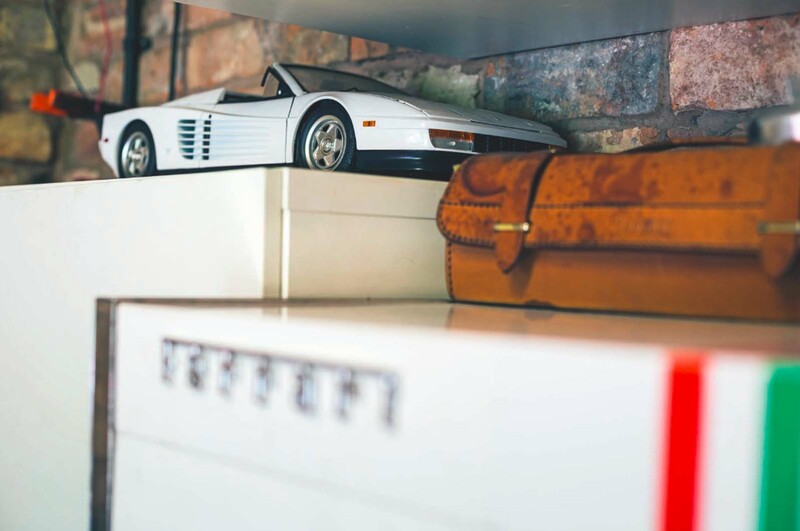 It’s why I have no trouble finding his place, since out on the road in front of it is part of his Ferrari collection: the Ratarossa and an F355 Spider; on the driveway, a 355 F1 Spider; and in the double garage, where the Ratty lives when it’s raining or Scott’s working on it, a 308. Over time, Scott has become a whizz with the spanners. He’s self-taught but little, short of dropping an engine for a timing belt change, is beyond him. He’s constantly on the internet, seeking out deals, parts and technical advice. Next on Scott’s Ratty to-do list is to refurbish the car’s steering and front suspension, give the engine a thorough service and tidy up the cabin. He’ll fit a sports exhaust too. It’ll all be done properly using genuine parts. As a final flourish, he’ll detail the engine so it looks like new. No need to ask why it’s just him and eight Fezzas these days. What’s the Ratarossa like to drive? Fortunately, the interior handle and door card on the driver’s side of Scott Chivers’ left-hook Testarossa spider is secure. Pull the handle on the passenger side and it comes off. No worries, I’m in the driver’s seat, wearing the stringbacks Scott thinks are total Don Johnson. I’m about to turn the ignition key but, first, let us pray. Down on my right is the famous Ferrari gate. I can’t wait. Reverse is down and forward; first, straight back. Better get those two right. I fire up the flat 12. There’s a cacophony of mechanical gnashing and a delicious intake howl when you dare to blip the throttle. No wonder Scott’s elderly neighbour complained to the council. 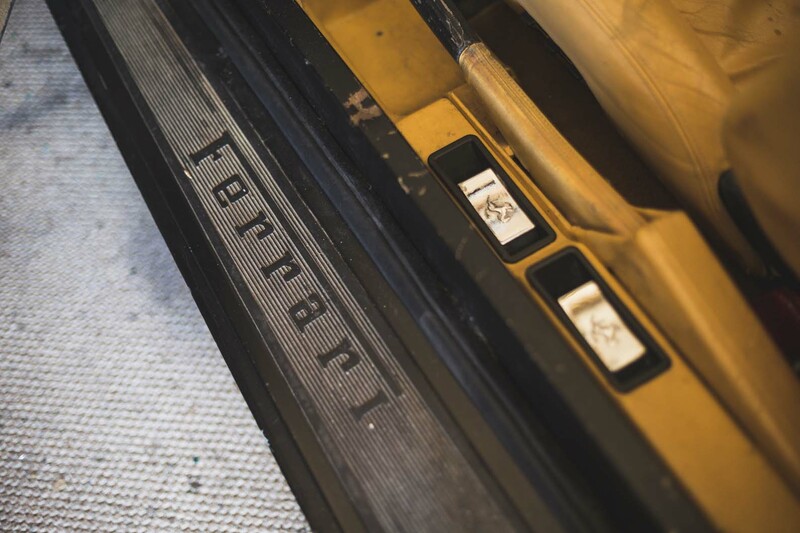 The pedal box is for Formula 1 drivers in Sparco slippers. I’m wearing motorcycle boots. I practise telling my B from my A. C, the clutch, weighs a ton. So do the front wheels. I can barely operate the steering. Pulling away is surprisingly smooth. First to second gear and beyond is a deliberate operation, although there is some spring bias to help tee the selector for each slot. There’s no lag or hesitancy as the engine accepts the next cog. The temperature looks good and the blue smoke on start-up has cleared. 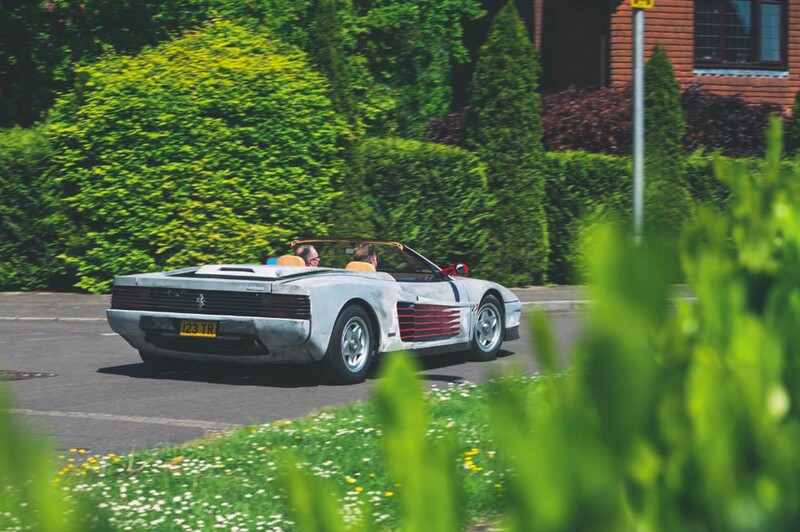 Given that its body has been stiffened with the equivalent of a garden gate, the Ratarossa feels surprisingly taut, at least at 40mph. The brakes are firm but progressive too. The steering has lightened up but it’s not what you’d call quick. You have to wind on the lock nice and early to avoid ploughing straight on. And is that petrol I can smell? “A small leak,” explains my co-pilot. Whatever its niggles, the Ratarossa is wonderful and unique. The looks of fellow drivers alone tell you that. Yes I think he’s got his priorities right, gotta have some fun! Take your foot out of that mans car! WTF! It doesn't matter if it's a piece of crap or not, it is not yours. ...I think you meant to write!